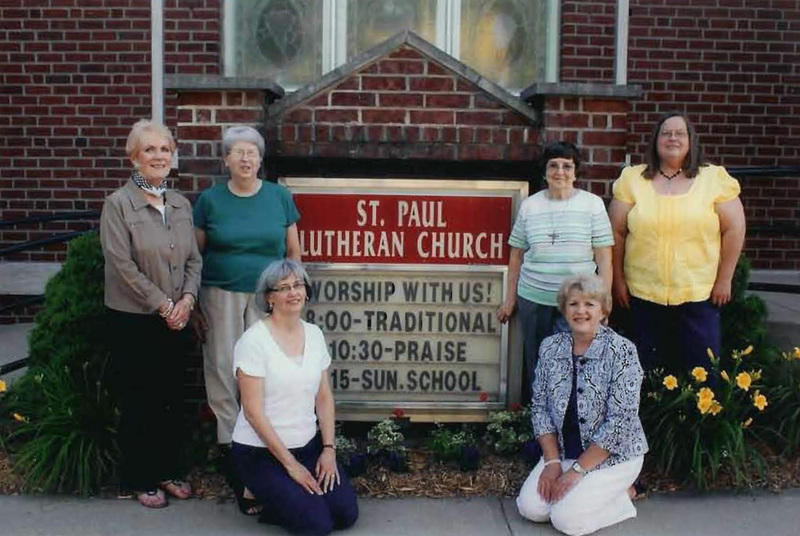 In March 2010, the St. Paul Lutheran Ministry Directors established a committee to formulate and put in action a plan for celebrating the 150th anniversary of the church and school. The goal of this effort: to celebrate 150 years of blessings and strive to make certain that all who come behind us will continue to find us faithful. The Celebration Bible verse, hymn and logo were selected by a congregational majority vote from many nominations and several sketches for a logo. 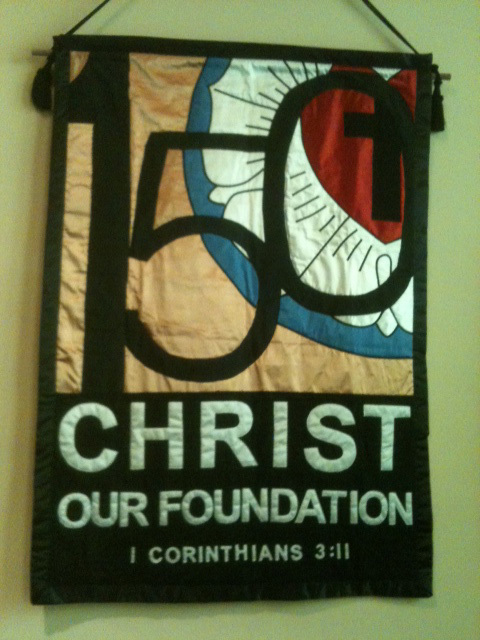 I Corinthians 3:11 was chosen as our celebration Bible verse, "The Church's One Foundation" as our celebration hymn, and the logo, designed by Daniel Mease, depicts the Luther Rose and our theme verse. Daniel Mease is a member of St. Paul Lutheran Church & School. He is a professional graphic artist that donated his talent to create our logo. He captured the essence of the celebration with Luther's Rose, our 150 years firmly supported by Christ, our Bible verse and in the background, a brick wall. The forming of the committee was the outcome of a 'good idea' list. The list included activities and ideas to promote and celebrate our 150 years past, present and future with input from organizations within the church and the Ministry Directors. The list was divided into categories and each committee member volunteered for one of the categories. With six members on this committee, we set up six subcommittees: Communication, Historical, Special Events – Church, Special Events – School, Memorabilia, and Consultant/Spiritual Leader. This subdivision resulted in the original Ministry Director selected committee being called the 'Core' Committee. Descriptions of each committee follows. This committee does the planning, organizing and implementation of each aspect of the 150th celebration. The committee chairperson is responsible to update the Ministry Directors quarterly or as requested on the progress of the committee, plans, budget and to request assistance when needed. The consultant for the 150th Anniversary Celebration Committee provides devotions for all Core Committee meetings and upon request to the subcommittees. The consultant provides assistance and guidance to the core committee in the planning and implementation of those plans. The Communications Committee works to keep the congregation, school families and the community informed throughout the planning and implementation stages. Once events are set, we will assist the Events Committee to keep information flowing on the what, when, and where. The Historical Committee captures the history of the church and school from 1861 until the present. The committee has implemented a number of projects such as an historical booklet, visual displays, a new pictorial directory, a cookbook, and an 8-page insert in The Leavenworth Times, our local newspaper. The Memorabilia Committee plans and implements various ways to 'remember' this important time in the life of our congregation. Their work has included the Memory Garden, Celebration Banner, Congregation Signature Quilt and various memorabilia items such as T-shirts, ornaments, mugs, letterhead, note cards, guest speaker gifts, and miscellaneous items to assist with events. Signature or Memory Quilts have been popular throughout the ages. As an example, these quilts were very popular with Victorian quilters in the mid-1800s and in the USA since the days of families moving west as pioneers. Signature quilts have been given as gifts by families and groups of friends for a special occasion, a leave-taking, a birthday, an anniversary, a new baby, a retirement, or other special occasion. The expansion westward is what actually brought about the desire for signing quilts like autograph books. During the mid 1900s, these quilts often displayed more than just signatures. People included sayings, poems or quotes from the Bible. They are intended to tell a story of a family or a community for future generations. 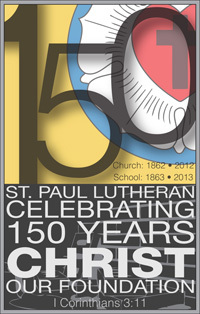 The St. Paul Lutheran 150th Anniversary Celebration Quilt is a special signature quilt to commemorate our current and past church and school families – from 1862 to the present. 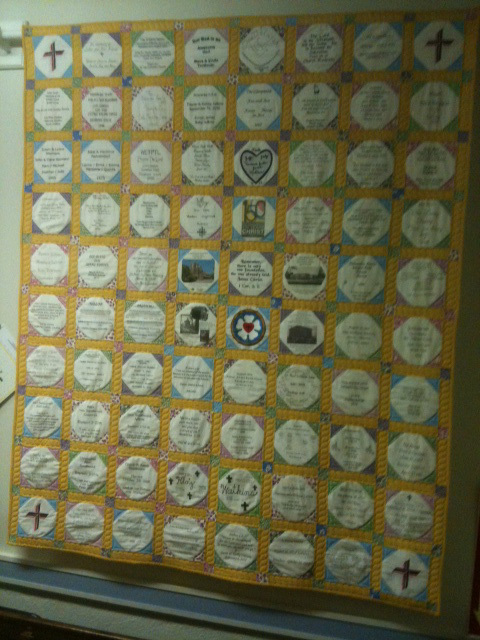 Our quilt hangs in the Church Basement. Members made donations to purchase fabric, batting and for the final machine quilting. Quilters of St. Paul chose 1930s Reproduction fabric and a simple Snowball quilt block. The machine quilting was chosen for specific reasons: the sashing has a rope style quilting that weaves all through the quilt to symbolize the 'tie that binds.' The corners of each block have triangle machine quilting representing the Holy Trinity; and the four 'leaves' in the sashing corner-stones symbolize the Holy Trinity along with God's grace. Corinthians 3:11), the Luther Rose Symbol and the 150th Anniversary Celebration Logo. This signature quilt is a snapshot in time for those who come behind us. May they find this Quilt as a symbol of our faith and legacy left to them by many of the members of St. Paul Lutheran Church & School. The grounds on the south side of our church facing Miami street, has always been a challenge to maintain due to the trees and shade. Grass does not grow there and the shrubs needed replacing. Once this committee determined that no one within our church family dedicated the crabapple tree or the shrubs in the area, the 150th Celebration Committee asked for permission to pursue a Memory Garden in this area. 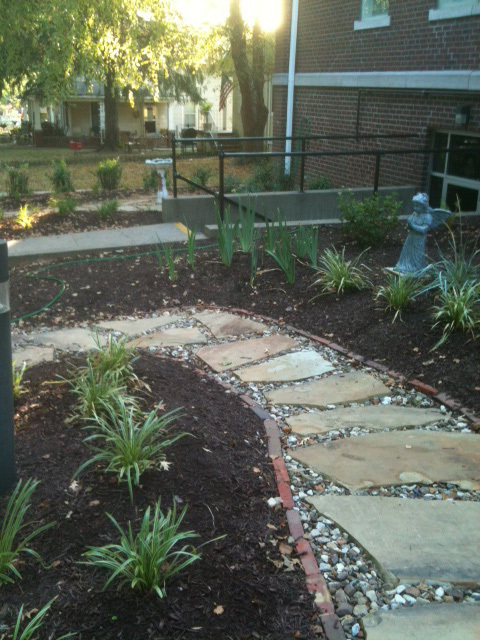 We now have a Memory Garden to memorialize those loved ones gone from us. We feel we have created a place that offers us the quiet and beauty for our entire congregation to use for meditating and remembering. As you can see, there are walkways, shade perennial plants and bushes, benches and settings of beauty. The lead for the Memory Garden planning and execution was member Luis Jimenez. Luis, who has an extensive background in planning and creating gardens, worked with a local nursery to provide all the materials and plants, including ground preparation, installing walkways, all materials, (gravel, flagstone, mulch, plants, and professional garden nursery labor). We were also provided the opportunity to work with church volunteers. 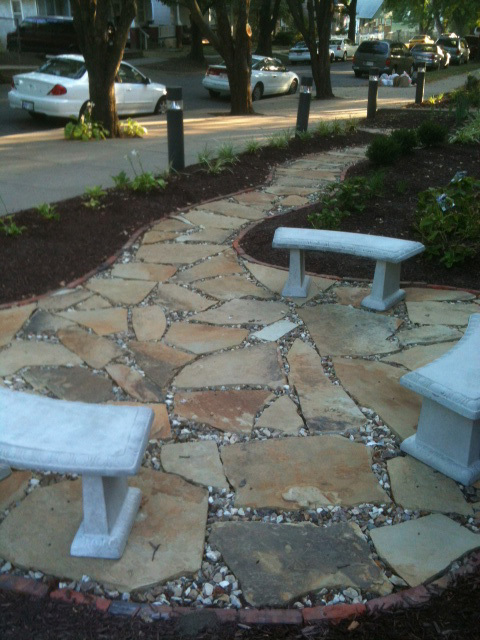 We have included plaques and embossed garden bricks to memorialize those that have passed before us. The Genter and the Redpath families have donated back to the church the sidewalk bricks that were removed from the front of the north parking lot and replaced with concrete. The family of Anna Butter donated a birdbath. The Olmo-Jimenez and Hummel families have donated two of the three concrete benches. We know that once the garden plan is known to all of you, that you will want to offer plants from your own gardens or other items to enhance the garden for many years to come. The church Special Events Committee plans celebratory events/gatherings that showcase our church's past, present and future. These events include dinners with former pastors and teachers as guests; dedication of the Memory Garden; celebrate our heritage with our military, peacemakers, and firemen; celebrate in an open city square with worship and a picnic; include our church and school in the city's annual Christmas Candlelight Vintage Home tour; involvement in our Thanksgiving community outreach dinner on Thanksgiving day; involvement in our church-sponsored community Christmas Market; and many other special worship services throughout the 16 month celebration. The school Special Events Committee works with the school staff, students, and their families to plan special ways to celebrate the 150th anniversary of the school. This will include special recognition of past and present staff, as-well-as past and present students; special service projects; and a variety of programs to include, dedication of a time capsule, a special 150th celebration school dance.